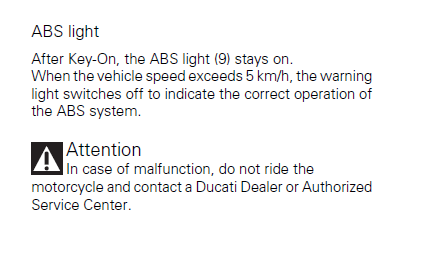 Ducati 899 Panigale Forum > Ducati Panigale 899 Forum : 899 Panigale General Discussion > Ducati 899 Troubleshooting > ABS light always on??? So I? decided remove my rear fairing ready for the new nrc tail tidy when it arrives so about a week later I've started her up for the first time & the abs light is stuck on no errors just constant light? Have you rolled it a few feet after starting the bike? ABS won't activate until you start to ride so the light will stay on until you initially get underway. Were you able to figure out what is / was going on???? Let us know what they find if you can.